What Makes This Book so Great Tor is my tenth published book, released January 16th 2014 in the UK by Corsair, and January 21st 2014 by Tor in North America. It won the Locus and Alfie Awards for Best Non-Fiction in 2015. This is a collection of the best of my posts on Tor.com, a hundred and thirty of my first five hundred. They’re mostly pieces about older books — Adams, Brust, Bujold, Butler, Clarke, Cherryh, Delany, Heinlein and so on, along with some consideration of what makes a series and how and why we read for pleasure. There are also a couple of spoof pieces written as April Fools. The back. Look at all those cool fonts! 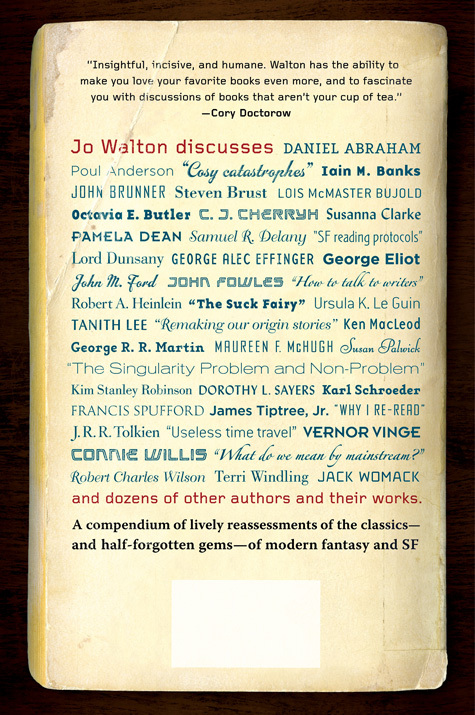 As any reader of Jo Walton’s Among Others might guess, Walton is both an inveterate reader of SF and fantasy, and a chronic re-reader of books. 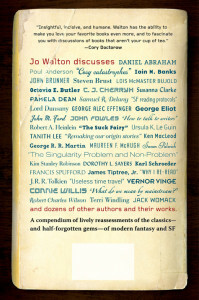 In 2008, then-new science-fiction mega-site Tor.com asked Walton to blog regularly about her re-reading—about all kinds of older fantasy and SF, ranging from acknowledged classics, to guilty pleasures, to forgotten oddities and gems. These posts have consistently been among the most popular features of Tor.com. Now this volumes presents a selection of the best of them, ranging from short essays to long reassessments of some of the field’s most ambitious series. Among Walton’s many subjects here are the Zones of Thought novels of Vernor Vinge; the question of what genre readers mean by “mainstream”; the underappreciated SF adventures of C. J. Cherryh; the field’s many approaches to time travel; the masterful science fiction of Samuel R. Delany; Salman Rushdie’s Midnight’s Children; the early Hainish novels of Ursula K. Le Guin; and a Robert A. Heinlein novel you have most certainly never read. Over 130 essays in all, What Makes This Book So Great is an immensely readable, engaging collection of provocative, opinionated thoughts about past and present-day fantasy and science fiction, from one of our best writers. 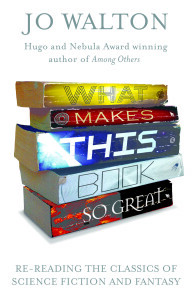 Goodreads page for What Makes This Book So Great. And this is the Publishers Weekly starred review. My piece on this book on the Tor/Forge blog. 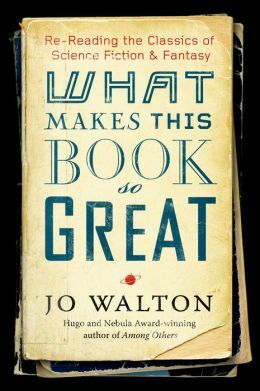 Walton’s critical gift is her ability to help you love your favorites even more, and to be fascinating, at length, on books you don’t give a damn about. This is a remarkable guided tour through the field — a kind of nonfiction companion to Among Others. It’s very good. It’s great. The whole book is, for lack of a correspondingly gender-specific adjective, avuncular, rather like spending a delightful night by the hearth in Bilbo’s hobbit hole, or with Mole and Badger. Q. Aren’t all these posts still available for free online? A. Why yes. Yes they are. Q. So why would I spend money buying the book? A. Beats me. Why would you? Q. Well, I might be a library or somebody who needs it for reference. A. That would be a good reason. Q. Or I might want to support you, or Tor.com, by giving you money so that you kept on doing this stuff. A. I do like philanthropists. Q. Or I might find a hardcopy more convenient. Or even having it on my e-reader is more convenient if I’m on the bus away from wifi. A. Right you are then. Q. Or I might like the way you’ve arranged the pieces for the book. Was that a lot of work? A. It was great actually. Patrick and Teresa Nielsen Hayden came up to Montreal for the weekend and we sat down and went through the whole lot and decided what to put in. It was really hard taking out the last 20 things that were good enough but there wasn’t space. It came down to what fit, and what authors were already represented. But on the whole, it was a ton of fun. Q. Are you going to do any more collections like this? A. Well now, if you want me to that might be a good reason for you to buy this one. Q. Why isn’t there an index? A. Indices are really hard to do. I spent months trying to do it and gave up. Having a professional do it is prohibitively expensive – it would have cost more than the advance for this book. Sorry. Q. Why did you call it What Makes This Book So Great? A. It amused me. Amd seriously, there’s so much negativity around, and what I’m expressing here is my enthusiasm. The title reveals that these are not objective measured criticism, they’re just me talking passionately about books. Q. Are you really passionate about books? A. Are you kidding? Books are one of the best things ever. Q. So I shouldn’t read this book if I hate books? A. Trying to sell books to the lucerative but elusive bibliophobic population does seem futile.